We are only strong together! That is why we make an effort for our employees and want to offer them the best possible working environment. We are happy to receive commendations that confirm our commitment. This is what former and current employees are saying on kununu.com about GLS as an employer. Decide for yourself what you think. Recommended by employees: We are a kununu top company. GLS receives the "Top Company" seal of approval from the kununu rating platform. This award is given exclusively by employees. Only an exclusive circle of 3.8% of kununu rated companies have qualified for this seal. The positive feedback is both a confirmation and an incentive for us to continue to be an attractive employer. 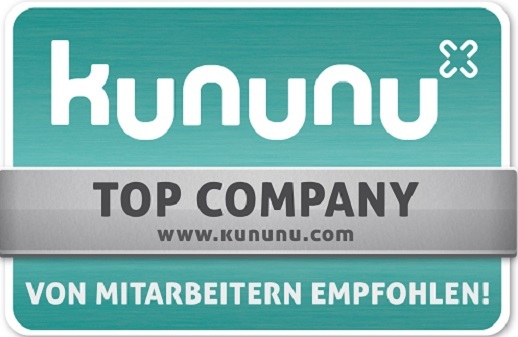 GLS has been awarded the distinction of an Open Company on the employer rating platform kununu.com. This seal is given to companies who maintain proactive interaction with the ratings. That is around 1% of the companies listed. The German Public Relations Association e.V. annually honors the best communication projects and its makers with the International German PR Award. GLS Germany is nominated with the launch of the career site in the category Employer Branding and is thus a finalist. The winners will remain secret until the ceremony on April 26th in Munich.